What’s the West’s best beach town? The region’s best tasting room? The campground we just can’t stay away from? Late last summer, to answer those seemingly insoluble questions, we launched the Sunset Travel Awards, a program that will honor excellence and innovation in travel and tourism around the West. In our June issue, we’ll share with you the first-ever winners in more than two dozen categories. We also have a Readers’ Choice Award that demands the judicious input of those who know Western byways better than anyone—you. 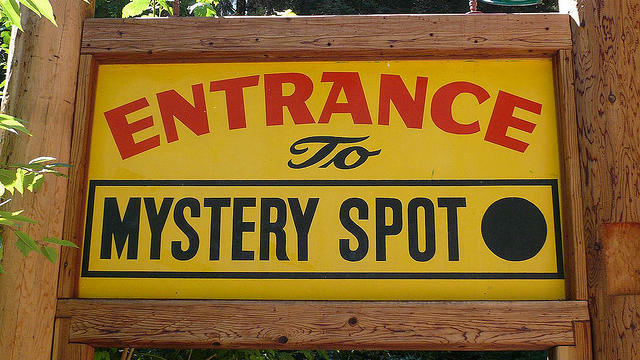 Please help us pick a winner for the West’s Most Outrageous Roadside Attraction. Santa Cruz, California. In this non-Newtonian dot of the Santa Cruz Mountains, water appears to flow uphill, billiard balls roll uphill, short people have major growth spurts, and tall folks shrink. No matter your size, you’ll walk away with a black-and-yellow bumper sticker. Inglewood, California. It’s a donut (22 feet in diameter) with star power, having had cameos in Earth Girls Are Easy, Mars Attacks!, Get Shorty, and many other films. In Iron Man 2, Robert Downey Jr. reclines inside the sign as he enjoys a glazed treat. Boulder City, Nevada. Unlike any heroic bronze you’ve ever seen. Stephen Liguori’s sculpture captures a hard-working “sanitation engineer” who loved his role, and his rolls. Driggs, Idaho. A two-ton tater sitting in the bed of a candy-apple 1946 Chevy truck—is this a great country or what? During the summer, you can catch a movie at one of the West’s surviving drive-ins. Roswell, New Mexico. “The truth is here,” proclaims the museum. Don’t miss the alien corpse from a 1994 Showtime movie. Like many of the exhibits, it’s out of this world. Moab, Utah. In the red rock country of southeastern Utah, Albert Christensen carved into a cliff face for 12 years to create a 5,000-square-foot home with 14 rooms. Click here to get to our virtual polling place.